For San Diego’s industrial real estate market, it doesn’t get much better than 2018. Not only did vacancy across the region’s warehouse, distribution and flex buildings hit a historic low, annual rent growth increased year-over-year, the amount of new space added to the market reached a decade high, and property sales set an all-time record. Backing that record development, leasing and sales activity in the market was the continued strong demand from tenants. In 2018, annual net absorption, or the net change in the amount of space occupied during the year and the amount vacated, topped 1 million square feet, continuing a trend repeated over the past seven years. That robust demand in turn drove the average vacancy to a record low at the end of the third quarter, to 4.3 percent. No San Diego submarket saw more leasing activity in 2018 than Carlsbad, which racked up 500,000 square feet of net absorption. Several large space users, including Acushnet, Pods and Zodiac, all moved into more than 100,000 square feet, with the latter two filling two of the newest buildings completed in Carlsbad: Pacific Vista Commerce Center and vec.tor at Carlsbad Oaks North, respectively. General Atomics, the largest defense contractor in San Diego, continued its expansion in Poway by moving into 300,000 square feet of build-to-suit space at the Ridgeway Business Park. That helped pace absorption in the area along the I-15 Corridor, which topped 500,000 square feet. In Otay Mesa, Zucarmex moved into 198,000 square feet at the newest building in Otay Logistics Center, while Trident and Carefusion will take possession of new buildings at Frontera Business and Siempre Viva Business Park,respectively, in the first quarter of this year. Otay Mesa topped 400,000 square feet of net absorption in 2018. 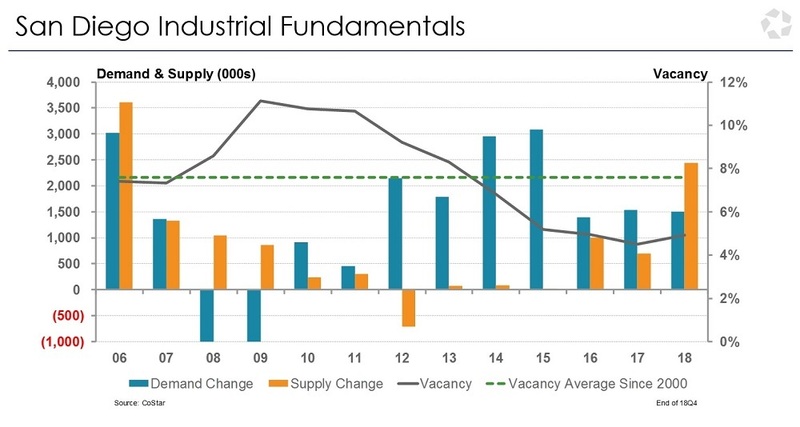 Average vacancy also hit a post-recession low of 6.5 percent in the San Diego’s flex market, a subsection of the larger industrial market consisting of smaller, flexible buildings capable of being used as office, medical, distribution, showroom or research and development space. Firms including Vertex Pharmaceuticals, Amazon and Fate Therapeutics all moved into, or expanded in flex buildings located in the UC San Diego area, with Vertex moving into 170,000 square feet in Torrey Pines, one of largest new commercial buildings completed last year. 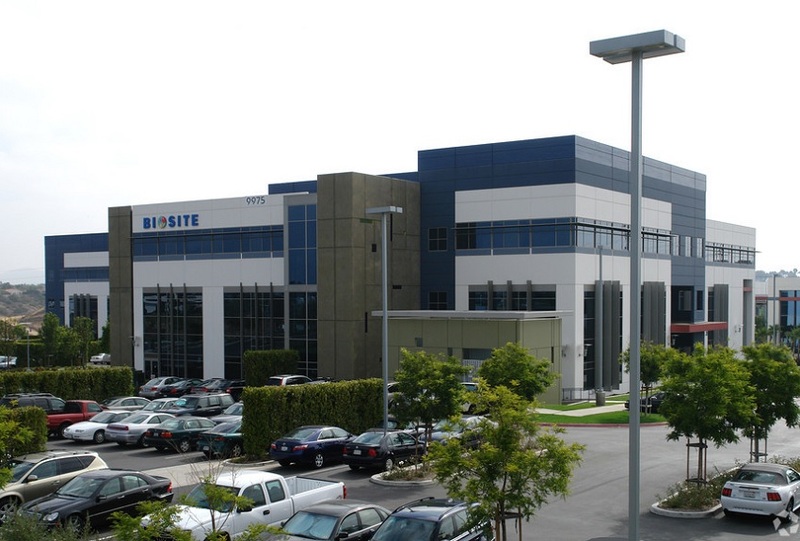 Annual rent growth in the San Diego industrial property sector responded in kind. Last year ended with rents growing 6 percent year-over-year, up from a 5.4 percent average increase at the end of 2017, and continuing the trend of increasing industrial rents for seven years. Every San Diego submarket notched rent gains of at least 5 percent, with UTC, short for University Towne Centre, pacing the county with 9.4 percent annual growth, while tech-heavy submarket Sorrento Mesa saw an average of 6.7 percent rent gains. Last year also marked the first time since the recession that developers added as much new warehouse and industrial space as the market average between 2000 and 2009. Construction on more than 3 million square feet was completed in 2018, with demolitions accounting for about 800,000 square feet of space. The bulk of the newly added space, more than 1.2 million square feet, was located in Carlsbad. At year-end, about 40 percent of the new space added in 2018 was still available. That may put some pressure on rent growth given that 1.6 million square feet of industrial space is under construction, 70 percent of which is available. Perhaps the most notable take-away from the year-end performance was that industrial property sales in San Diego increased for the fifth straight year, with 2018 posting the highest annual sales volume on record, according to CoStar. At the time of this writing, total industrial property sales stood at $1.9 billion for 2018. Meanwhile, property sales in 2018 started off on a strong note after Alexandria Real Estate Equities purchased the Fenton Technology Park in Sorrento Mesa for $148.7 million in January. Looking ahead, the substantial amount of new speculative construction of industrial property is expected to add an element of supply pressure in 2019. But the life science and tech firms that are the lifeblood of San Diego’s economy continue to expand, leasing more space and fortifying rent gains that are expected to remain above the market’s long-term average for at least another year.